Since 1999, Sauers provides efficient and experienced snow plowing service. As a snow and ice management company, we prepare and think Winter year-round. During the winter season, we provide 24-hour snow plowing service, snow removal, and snow relocation services for your business. When other businesses are halted, your business will be operating because of Sauers. Each commercial property gets the specific services it requires and requests. Your tenants, customers, patients, and employees can travel your property safely and freely. But our snow removal service doesn’t end when the snow stops falling. We continue to monitor your site days after a snow event has ended to address any concerns of refreeze, or any other safety issue that may occur after the storm. Contact us to discuss your snow plowing service needs. 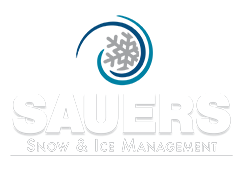 If your property has Zero-Tolerance Snow Removal Policy, Sauers Snow & Ice Management company can help.